WASHINGTON (CNS) — Many U.S. Catholic colleges are well prepared for the pope’s visit to the United States and have been gearing up for it with spiritual programs, discussions, service projects and social events that almost always include a Pope Francis cardboard cutout. The colleges located in the three cities where the pope is visiting — Washington, New York and Philadelphia — are particularly pulling out the stops by donating their parking spaces, rescheduling classes and sending groups of students as volunteers to help at papal events. For The Catholic University of America in Washington, the pope couldn’t get much closer. When Pope Francis celebrates an outdoor Mass Sept. 23 on the east portico of the Basilica of the National Shrine of the Immaculate Conception, the crowd will be assembled on the 3.6-acre outdoor space where the university holds its annual commencement ceremony. A number of students received some of the 25,000 tickets allotted for the Mass and at least 500 students will be volunteering. No classes will be held that day. 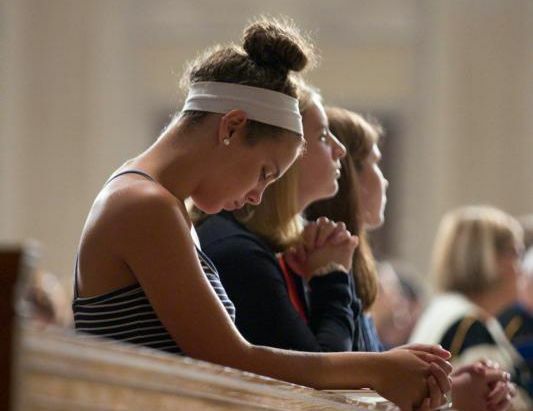 Students from other colleges in the Washington area have been taking the Walk with Francis pledge, committing themselves to prayer, service or advocacy work advancing the pope’s mission. Several colleges are hosting viewing parties for papal events, including St. John’s University in New York, which will be hosting a lock-in retreat Sept. 25 that will include viewing the pope celebrating Mass at Madison Square Garden followed by dinner, discussion, opportunities for prayer and the sacrament of reconciliation. A small group of students is planning to attend the papal Mass Sept. 27 in Philadelphia. St. Joseph’s University in Philadelphia is hosting a variety of talks in September, primarily emphasizing challenges faced by modern families, because the World Meeting of Families will be taking place in their city Sept. 22-27. The university is located less than a mile from St. Charles Borromeo Seminary, where Pope Francis will meet with U.S. bishops taking part in the World Meeting of Families the morning of Sept. 27. Three faculty members from Villanova University, about a half-hour drive from Philadelphia, are serving as panelists during sessions of the World Meeting of Families. The school is rescheduling classes and offering its parking facilities during the weekend to people who wish to take public transportation to events. A number of students, faculty and staff will be volunteering at the meeting which is expected to draw 2 million participants. A week before the event even begins, a group of Villanova students plan to assemble “pilgrim packs” at the Philadelphia Convention Center to be distributed to World Meeting of Families’ participants. And on Sept. 26 another group of university volunteers will assist with guest relations and crowd support at the Festival of Families on the Benjamin Franklin Parkway, one of the city’s main thoroughfares. The university volunteers will be responsible for two city blocks throughout the day. About 25 miles away from Philadelphia, the campus of Gwynedd Mercy University, in Gwynedd Valley, will be hosting a pope-a-palooza program, welcoming students from at least four other Mercy schools for a four-day program of service, prayer and advocacy work. The activities will include a trip to Philadelphia for the closing Mass of the World Meeting of Families celebrated by Pope Francis. Students from a number of Catholic colleges also are taking part in papal events behind the scenes. A University of Notre Dame architecture graduate designed the sanctuary and furniture for the papal Mass in Philadelphia and architecture students from Catholic University designed the altar and chair the pope will use Sept. 23 for the Mass in Washington when he canonizes Blessed Junipero Serra. But it’s not just designs and panel discussions in which students and faculty are involved. A hymn written by Norbertine Father Andrew Ciferni, director of the Center for Norbertine Studies at St. Norbert College in De Pere, Wisconsin, has been selected as the official hymn of the World Meeting of Families.